After getting off the bus and dragging our bags up a couple of flights of stairs we were understandably hot and needed a beer. I wanted something other than a lager and ended up settling on a Hoegaarden. 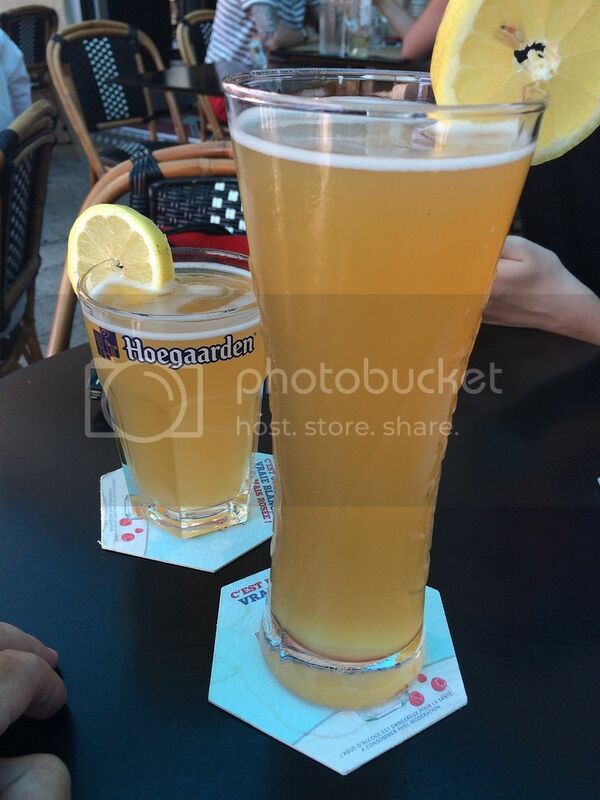 I really do enjoy Hoegaarden and was shocked to find I've never reviewed it! Witbier fan's I will rectify this after I get home! The beer selection on offer at restaurants in Nice is pretty poor on the whole and so coming across Carlsberg on Tap at this Tapas bar we had dinner at was a nice surprise. This Carlsberg tasted like Carlsberg as well, all ways a positive with the tendency for some of these bars in France to have quite badly skunked lager. 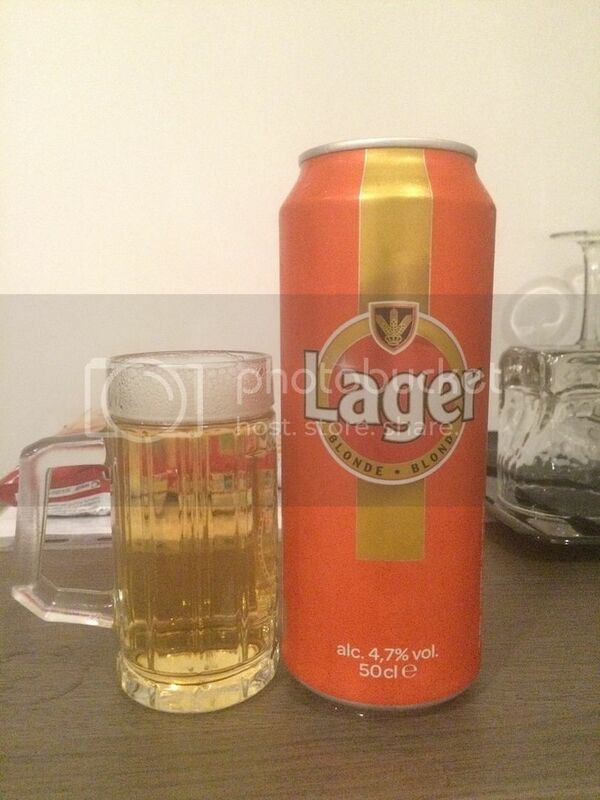 I haven't reviewed Carlsberg in full either, but surely you all know what Carlsberg tastes like? 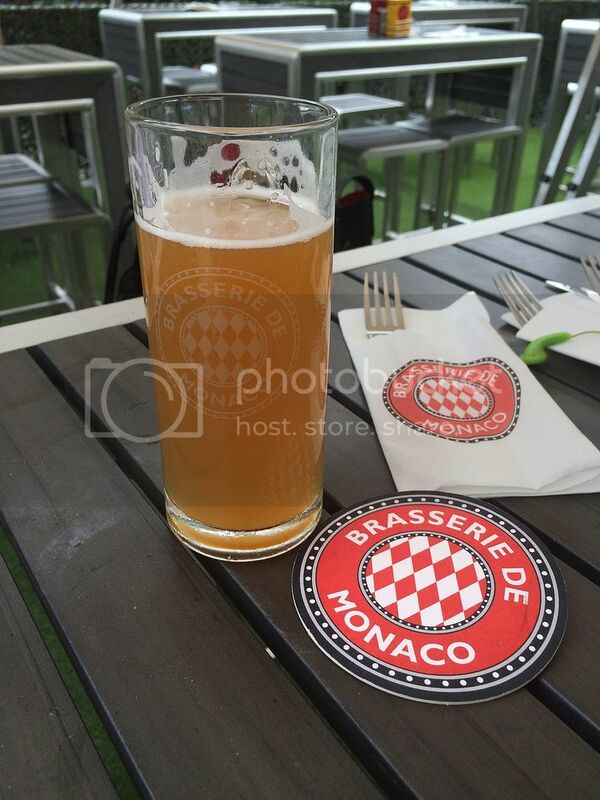 We took a day trip to Monaco the next day and naturally stopped in at the brewery for lunch. Brasserie de Monaco is right on the water in the principality and is massive! The outside area has to seat at least 150 people and inside is large as well. I ordered the paddle, as usual, which has 3 offerings on it. On the day we visited you could try the Blanche (a hefeweizen), Blonde (a pilsner) and their Cider. The hefeweizen was lovely, with plenty of citrus with orange the most prominent. The cider was also nice, despite be not really being a cider drinker. It was spritzy, with an awesome pink colour and not too sweet. 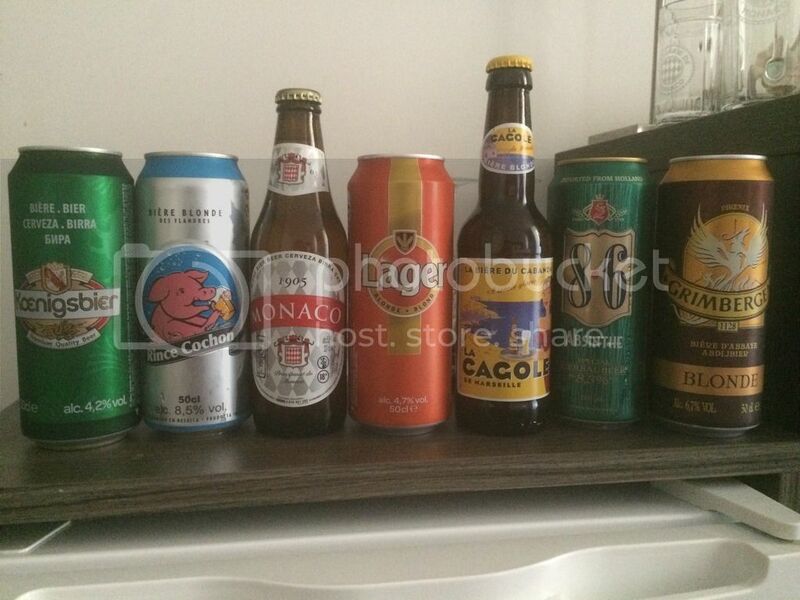 The pick of the beers was their Pils though. It was unfiltered and very flavoursome, with citrusy hops complimenting the slightly sweet malts very nicely. I liked my tasting glass so much that I ordered a full pint of it afterwards and it didn't let me down! It was the perfect accompaniment to the hot weather and great food at the brewery! Koenigsbier was the first of the beers I had back at the Hotel that I cracked into. Straight out of the fridge I thought this wasn't that bad... As it warmed though, I had to admit I was wrong. It was too sweet with very little hop bitterness to balance it. Rince Cochon is a beer I knew of before heading to Europe, not because the beers reputation proceeded it - but because they have an iconic beer glass with a pig at the base of the stem. The beer I had was appalling! I don't know if it was a bad can or something along those lines, but the ABV was far too high and it was tasted like I imagine a 8.5% Blonde Ale that's skunked would taste like... It was appalling! I would give it another try in the future as I do feel this can was ruined. So guys, that's finally the end of France. I can't wait to get into the Italy trip wrap up for you, trust me it's a big one! There's also some more Macro Lager reviews coming for you and also a very special surprise, stay tuned over the next few days for that. In the meantime, email me - gus.norris7@gmail.com , hit me up of Twitter - @Beeroclockau , or simply comment below. Cheers guys!